Around since the last decade, providing professional storage services to the most discerning collectors around Asia. An efficient team that have extensive experience in handling fine wines, and understanding our customer’s particular needs. Our desire is to meet all your needs in storing and managing your fine wines including your home cellar. We believe in personal touches and are always ready to go the extra mile. Customised services and quotations for each individual. Arrange shipment for your wine purchased overseas. At Wine Bond, we offer peace of mind by adhering to the strictest security. Because like you, we too are collectors and fully understand the concerns. 24/7 guards on petrol, face recognition devices for entrance to the warehouse and all lift access are controlled. Here are some reasons why WineBond is the choice for fine wine storage. 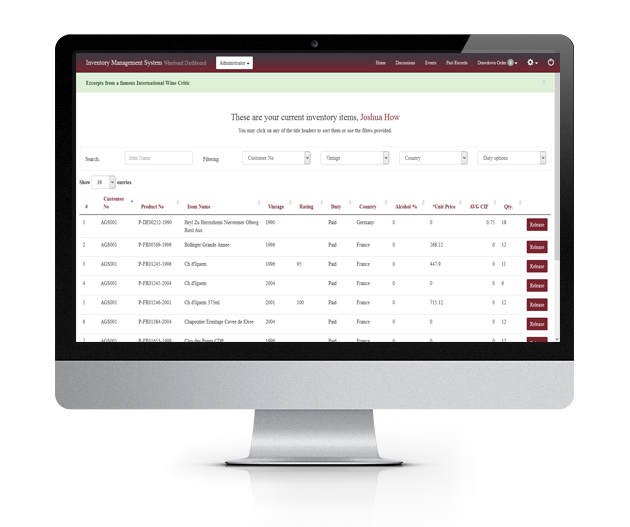 Every client automatically is a user of our inventory system, where you are able to track the movement of all your wines. Request for your wines instantaneously online. Receive the latest news from the wine world. Wine Marketplace exclusively for our clients. Our team is at your beck and call for any requests. We will do our very best to assist in any way we can.